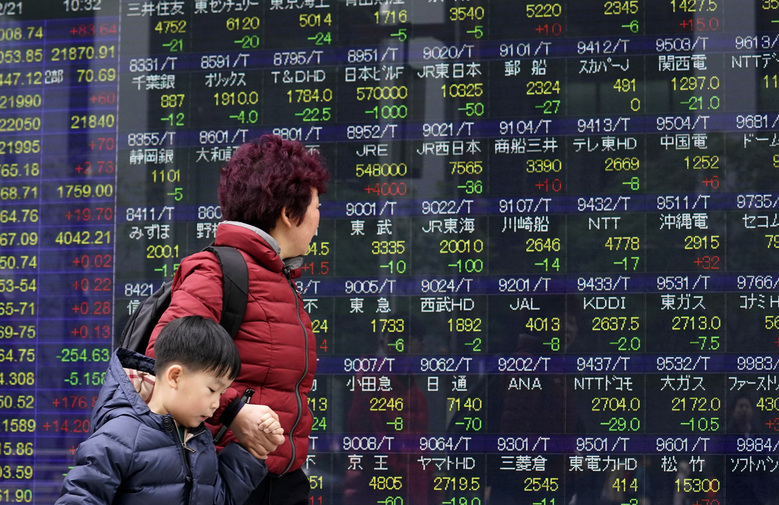 Shares were higher in Asia on Wednesday, supported by rosy manufacturing data from Japan. The gains came despite losses on Wall Street, where a six-day winning streak was snapped by a plunge in Walmart stock and losses in other sectors. KEEPING SCORE: Japan's Nikkei 225 index climbed 0.6 percent to 22,064.55 and Hong Kong's Hang Seng advanced 1.0 percent to 31,169.79. Australia's S&P ASX 200 edged 0.1 percent higher to 5,946.00 and the Kospi in South Korea added 0.3 percent to 2,422.34. Shares in Southeast Asia were mixed. Markets in mainland China were closed for a final day of lunar new year holidays. WALL STREET: Walmart's stock sank 10 percent on Tuesday, its biggest drop in 30 years, as a late sell-off erased early gains led by technology companies. Grocery store operators, retailers, health care companies and industrial stocks accounted for much of the market's slide. The Standard & Poor's 500 index fell 0.6 percent to 2,716.26 and the Dow Jones industrial average slid 1 percent to 24,964.75. The Nasdaq edged 0.1 percent lower to 7,234.31. The Russell 2000 index of smaller-company stocks gave up 0.9 percent, to 1,529.99. BONDS LOOM: The rising yield on the 10-year Treasury, which is used as a benchmark for mortgages and other loans, is making bonds more appealing than stocks. It has been rising in recent months from a low of 2.04 percent in September. Early Wednesday it was at 2.90 percent. "Some of the broader concerns on investors' minds right now are looking across to the bond market and seeing the 10-year Treasury starting to approach that 3 percent level," said Bill Northey, vice president at U.S. Bank Wealth Management. JAPAN MANUFACTURING: Preliminary results from a survey of manufacturers in February showed indicators at their strongest level since early 2014. The Nikkei Japan Manufacturing PMI (purchasing managers index) was at 54 on a 0-100 scale where reading exceeding 50 indicate expansion. Job creation hit an 11-year high. "Export growth slowed from January's peak but remained solid," Bernard Aw, principle economist for IHS Markit said in the report. ENERGY: Benchmark U.S. crude fell 47 cents to $61.32 per barrel in electronic trading on the New York Mercantile Exchange. It rose 24 cents to settle at $61.79 per barrel in New York. Brent crude, used to price international oils, shed 39 cents to $64.86 per barrel. It gained 42 cents to close at $65.25 a barrel in London. CURRENCIES: The dollar rose to 107.82 yen from 107.33 yen on Tuesday. The euro edged lower to $1.2335 from $1.2337.